Population dynamics generically refer to the characteristics of a population through space and time. Characteristics of interest to ecologists often cover a wide range, from the density of individuals, or the size structure of a population, to the variation in color display among individuals, or the spectral density of population cycles. From a statistical perspective, these characteristics have been referred to as probes, and statistical models can be developed to fit whichever probe, or multiple probes, are of interest. For example, a researcher may want to characterize both the variation in population abundance, as well as the temporal change in the ratio of juveniles to adults. By developing a population model and fitting it to data, possible processes behind the characteristics can be revealed. Fitting statistical models to probes at different hierarchies (as in the above example) is sometimes referred to as pattern-oriented modeling, and may increase the likelihood of identifying biological processes from population patterns. Statistical models are classified as being either phenom-enalistic or mechanistic depending on their purpose. Phenomenalistic models focus on describing and predicting population patterns, whereas mechanistic models focus on the inverse problem of inferring biological processes from observations of population characteristics and a biologically motivated model. While much of the statistical machinery is the same for both, this article focuses on the common methods and approaches encountered when fitting biologically motivated statistical models. Figure 1 Population dynamics of the marine alga Thalassiosira pseudonana. Observed algal dynamics are shown with circles, and predicted dynamics from a logistic growth model with observation error are shown with lines. Predictions are shown for normal observation error (solid line), lognormal observation error (dashed line), gamma observation error (dotted line), and Poisson observation error (dot-dash line). Data digitized from Davidson K and Gurney W (1999) An investigation of non-steady-state algal growth. II. 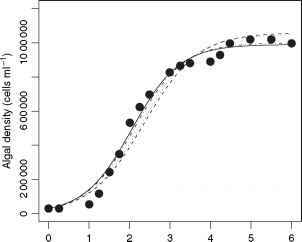 Mathematical modelling of co-nutrient-limited algal growth. 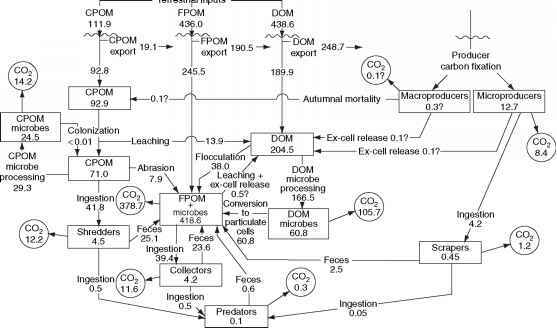 Journal of Plankton Research 21: 839-858.
and methods required to develop the statistical model from the population model, and to fit the model to data.